As the boxing world takes a deep breath for a week, before resuming the tremendous high-quality action that 2017 has provided so far, a certain Mexican legend quietly continues his attempt to arrive back at the top level. 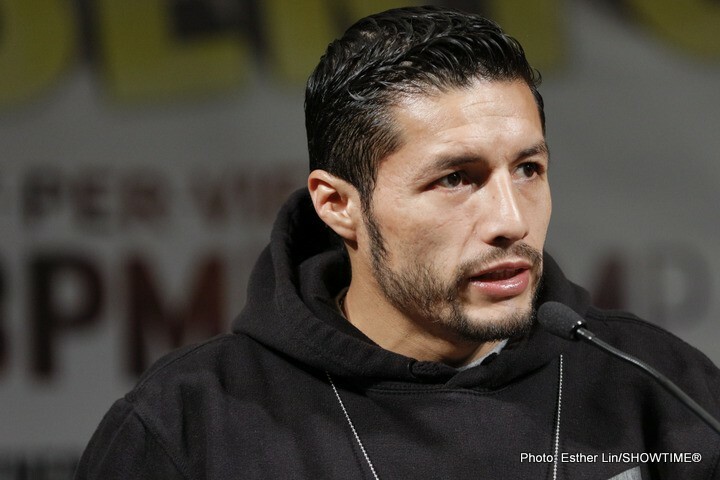 Jhonny Gonzalez, 63(53)-10(4)-0, has belonged in upper echelon of fighters for a significant portion of his storied career, and a victory on Saturday would inch him closer again to those heights. His upset majority decision loss to the solid but unspectacular Jonathan Oquendo, appeared, on top of the brutal destruction he suffered at the hands of Gary Russell Jr, to signify the end of his position as a contender. Since then however, Gonzalez, now 35, has racked up five consecutive wins, albeit against lesser competition. On Saturday he will fight for his sixth of these victories, against the undefeated Jessie Cris Rosales. Of the recent foes Jhonny has elected to rebuild against, Rosales, from the Philippines, makes for perhaps the most interesting contest. Going into the fight with an impressive 21(9)-0-1 ledger, he undoubtedly comes in with the confidence of a fighter who has yet to find his level, his lone draw coming way back in 2011, and the increased will of a man wanting to hold onto his unconquered status. The caveat ‘on paper’ is necessary to add when looking closer at that record however. Rosales’ opponents have been unquestionably of a low level, all of whom might be unrecognisable names even to those who follow the sport closely. Having only stopped nine of these unremarkable adversaries, his power is also not shown in an impressive light. Rosales does not enjoy a size advantage either, both men are of similar stature, though the Mexican’s reach appears longer. Footage of Rosales’ fights show a boxer with a reasonable punch variety and adequate footwork, but importantly a bad habit of dropping his hands in range, which Gonzalez will be looking to capitalise on. In Rosales’ favour, reports suggest he is in the ‘best shape of his life’ (SunStar Cebu, 20/07) and that he seems confident of victory. Nevertheless, it remains a possibility that the undefeated prospect has so far fought down to his level, and will produce his best work against an opponent of Gonzalez’s class. The fight will be for Gonzalez’s WBC Latino Super Featherweight title, his first defence, and may boost Gonzalez up the rankings from his no. 5 spot if he is successful. For Rosales, it will be a huge opportunity to make his name, if he should overcome the faded former champion. The bout takes place in the Lienzo Charro Parral, Hidalgo Del Parral, Chihuahua, and will be televised on Mexico Televisa.